DETROIT (Bloomberg) -- The UAW, whose leader has staked its future bargaining power on organizing U.S. plants of Asian and European automakers, plans to start pressuring the companies through dealership campaigns. Regional UAW representatives trained members about how the campaign will work at UAW Local 2209 on Nov. 19, said Mark Gevaart, president of the local in Roanoke, Ind. The union hasn't selected the automaker it will target and didn't discuss when the drive will begin, he said in a phone interview. Restoring the UAW's clout in negotiating with the industry depends on organizing the U.S. factories of automakers such as Toyota Motor Corp. and Daimler AG, union President Bob King told members at the union's bargaining convention in March. The UAW has failed in attempts to organize Toyota, Honda Motor Co. and Nissan Motor Co.'s U.S. plants in the past. "King has to find some way of cracking open the transplants," Gary Chaison, a professor of industrial relations at Clark University in Worcester, Mass., said in a phone interview. "He has to generate revenue, and for unions generating revenue means more members." The UAW's membership increased last year by 6 percent to 376,612, according to a March 31 filing with the U.S. Labor Department. After its first annual membership gain in six years, the UAW would have to almost quadruple in size to return to its 1979 peak of more than 1.5 million members. Michele Martin, a spokeswoman for the UAW, declined to comment about the dealership campaign. "This is not a picket in any way," Gevaart said. The meeting at UAW Local 2209, which represents workers at General Motors Co.'s Fort Wayne Assembly plant, lasted about 90 minutes, he said, without giving more specifics. Cody Lusk, president of the American International Automobile Dealers Association, today criticized the UAW move.The group represents about 10,000 U.S. import dealerships. 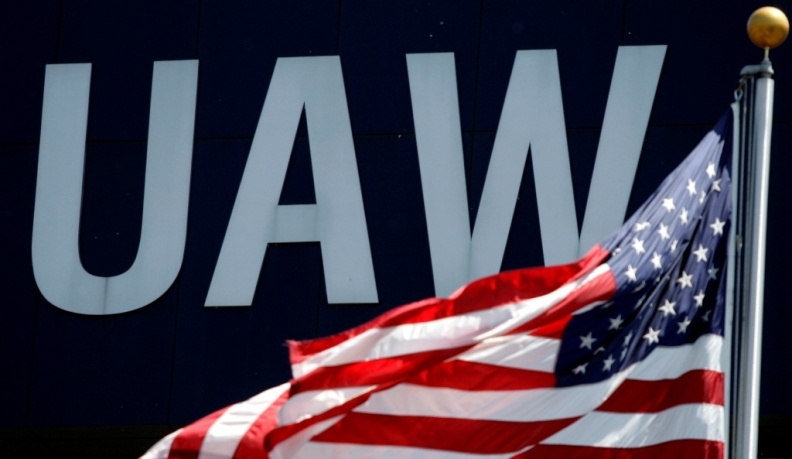 "The UAW's most recent threat to target dealerships in their campaign to unionize international nameplate manufacturers is unwarranted and will only hurt these small businesses, their employees, and communities," Lusk said in a statement. "The UAW would be better served focusing their energies on constructing a convincing argument to present to plant workers who have voted against unionization numerous times." The National Automobile Dealers Association expressed similar concerns. “While details of the UAW’s ‘dealership campaign’ are not public, the National Automobile Dealers Association would have serious concerns about any efforts that interfere with the car buying process or frustrate customer satisfaction at dealerships," the association said in a statement. NADA, which represents nearly 16,000 new car and truck dealerships that employ almost 1 million people, also warned the campaign could backfire. "Attempting to disrupt new-car sales by targeting small businesses whose employees and families are dependent on those sales could create a public backlash and be counterproductive for the entire industry," NADA said in the statement. King, 65, secured new four-year contracts with GM, Ford Motor Co. and Chrysler Group in September and October. The union avoided a strike with Ford and reached agreements with GM and Chrysler without arbitration. The UAW president was "statesmanlike" in negotiating deals with the three U.S. automakers this year, said Art Schwartz, president of Labor & Economics Associates in Ann Arbor, Mich. The union still is likely to get pushback from any automaker it targets for organizing and has yet to convince workers that they need union representation, he said. "The UAW has got a really tough chore in front of them to organize these plants," Schwartz, a GM former labor negotiator, said in a phone interview. "They probably are going to try every tactic they can. This is important, especially to Bob." After members ratified the last of the three accords with Chrysler on Oct. 27, King told reporters on a conference call that he still hoped to organize a non-union plant in the U.S. this year. He has said the union set aside $60 million from its strike fund this year for the organizing push, and in January warned that the UAW will label any automaker that tries to block its efforts as a "human-rights violator." The UAW's challenge will be crafting its pitch to non-union autoworkers while companies such as Toyota and Volkswagen AG expand their workforce by adding production and opening new U.S. factories, Clark University's Chaison said. Toyota opened a plant in Mississippi last month to build Corolla compact cars, while Volkswagen began making Passat sedans in Tennessee earlier this year. VW pays employees about $27 an hour in wages and benefits at its factory in Chattanooga, less than the more-than-$50 rates paid to hourly workers at GM, Ford and Chrysler, according to Barclays Capital. "The UAW has to play this one carefully," Chaison said. "They have to work not on the premise that these are improving times, but that they're just not improving as much for workers without a union, and that that's unfair." Danielle Emerson and Automotive News staff contributed to this report.